Carla del Ponte, the former chief prosecutor of the International Criminal Tribunal for the Former Yugoslavia (ICTY) in The Hague, has recently been confronted with charges of intimidation of witnesses, which has led to the tribunal’s opening an investigation into the matter. This was made public by the British newspaper “The Guardian” in an article dated August 18th 2010. According to this article, the court will nominate an external expert to examine the accusations and decide within six months whether a lawsuit is justified. 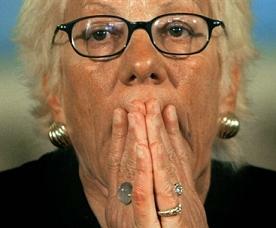 Del Ponte’s former close associates, Daniel Saxon and Hildegard Ürtz-Retzlaff, are affected by the accusation as well. The charges were brought forward by the Serbian politician Vojislav Seselj, who himself is a Hague prisoner. The alleged victims of intimidation are several witnesses of the prosecution in his trial. Seselj voluntarily surrendered to The Hague in 2003, this in spite of the fact that he does not recognise the court, arguing that it has never been legitimised by the UN general assembly, which in fact should be mandatory according to the UN Charter. The trial against the politician, who once presented himself as the nationalist alternative to the more Yugoslav-oriented former Serbian president Slobodan Milosevic, finally started at the end of 2006 and is still going on today, with several interruptions and so far with no relevant results. The fact that the ad hoc tribunal of The Hague deems it necessary to take this case into consideration in one way or another is in itself remarkable. After all, the tribunal’s manner of conduct cannot be called impartial: the methods The Hague employs to reach their desired convictions range from the denial of the right to self defence, to silencing the microphone when the accused speaks out on facts that are embarrassing to the prosecution or, as already mentioned, the intimidation of witnesses. Such occurrences happened often enough during the Milosevic trial, as when the former head of the Serbian secret service, Radomir Markovic, testified as a witness of the prosecution that he had been pressured in Belgrade to wrongly accuse Milosevic of having ordered war crimes. For this he was offered a new identity abroad, but after these revelations, Markovic was sent back to Serbia where he is still serving a prison sentence. Another way to make the witnesses tell the most fantastic stories are the so-called “plead guilty” lawsuits: someone who is accused of having committed war crimes by himself and who has testified already can be convicted in a summary procedure without the prosecution having to investigate and to prove the confession. The only important thing is that the right persons are being charged. The most well known example is the case of the Bosnian Croat Drazen Erdemovic, who pleaded guilty in 1996 to having served in the army of the Bosnian Serbs and having participated at the so-called “Srebrenica massacre” in July 1995. In 2000 Erdemovic was set free and was offered a new identity. Since then he has served the prosecution as a protected witness in several trials. Even the charge of having committed “genocide” in Srebrenica against the former Bosnian Serbian president Radovan Karadzic and his army chief General Ratko Mladic is based on Mr. Erdemovic’s confessions. The German-speaking journalist Germinal Civikov has written a book that deals with all the contradictory statements Erdemovic has given, and all the obvious lies he is telling. Babic will not be able to be questioned any more: he died in his cell in The Hague in March 2006, officially because of suicide, one week prior to Milosevic’s death under suspicious circumstances. The justification of the destruction of “IDs, photographs and pieces of clothing” (B92) with the lack of sufficient storage space to archive them appears strange indeed, if one considers that we are talking about an incident that politicians and the mainstream media claim to be the “worst massacre in Europe since World War Two”. And in the ongoing trial against Radovan Karadzic, the politicians planned conviction for his alleged responsibility for “genocide” is supposed be justified with the Srebrenica case. The question should be allowed (without any intention to downplay the suffering of the Mothers of Srebrenica) if the destroyed documents maybe did not fully sustain the official version of the happenings in Srebrenica. After all, there was extensive fighting in the region, especially when soldiers of the Bosnian Muslim army were trying to break through the Serbian lines and reach the Muslim-controlled town of Tuzla. Dorin speaks of 2000 soldiers who died during the fighting and are now being counted as “massacre victims”. Or, if soldiers were actually murdered, this alone is not conclusive evidence for a crime that was ordered from above, as the prosecutors of the tribunal pretend to know. In any case, no written or otherwise recorded order from the hand of President Karadzic or his chief of army, Mladic, pertaining to the killing of soldiers or civilians has so far been found. But it is a fact that there was at the time a great amount of hatred on both sides in that region: the Muslim warlord Naser Oric, whose specialty was the production of videotapes of “burning houses, dead bodies, severed heads, and people fleeing”, was spreading terror among the Serbian villages around Srebrenica, which were officially declared a UN “safe haven” before the Serb invasion. Many other writers are nowadays contributing to the debunking of the official version of what happened in Srebrenica. Apart from the authors already quoted in this article, one should mention Philip Corwin , who was the highest UN-representative in Bosnia during the war (1992 – 1995), the journalist George Szamuely , and the well known writer Prof. Edward S. Herman , among many others. The media’s prejudgment of Serbia, with the use of the term “genocide” when referring to Srebrenica as its climax, has enabled the tribunal to act in ways that serve neither the finding of truth nor the reconciliation between the Yugoslav peoples. The construction of “evidence” with the use of dishonest methods is intended only to justify in retrospect the western politics towards the Serbs as an “inevitable reaction” to their “savage and ruthless” behaviour. So The Hague is using a strategy of creating “evidence” that puts the blame solely on the Serbian policymakers who were in power during the war, holding them personally responsible for the planning and execution of all the atrocities that took place in the civil war. A conflict that actually was fuelled from the outside is being presented to the western public as a “joint criminal enterprise” for the creation of an ethnically cleansed “Greater Serbia”. It can be assumed that the tribunal will find a way to whitewash itself from the accusations. But the fact that the prosecutors will for the first time be forced to explain some of their strange conduct before a broader public restores an inkling of hope that the mainstream version of what happened with Yugoslavia will not be the one that people will learn in the future. See trial transcript from 26 07 2002: http://www.milosevic-trial.org/trial/2002-07-26.htm. Civikov, Germinal: “Serbrenica. Der Kronzeuge”, Wien 2009. See trial transcript, 16 September 2005, page 44264: http://www.milosevic-trial.org/trial/2005-09-16.htm. Dorin, Alexander: “Srebrenica. Die Geschichte eines salonfähigen Rassismus”, Berlin 2010. See interview with Alexander Dorin in “junge Welt”, 10 July 2010: http://www.jungewelt.de/2010/07-10/051.php.